Installing multiple programs on a PC can be a time consuming task and in case you have to do that on multiple PC’s, then let’s say you’re doomed. So how can you install multiple programs at once in windows? Fortunately, the solution is easy, you can either make a backup of any windows operating system with all the important software’s installed and later restore it. Alternatively, a easier and more convenient solution would be to make use of custom installers available on the internet to install multiple programs at once. The best part about these custom installers is, you want have to agree to any TOS or pesky notifications for installing additional software and toolbars. For those who need to install multiple programs on a computer and want it to be quick and hassle free, you can create your own custom installer at Ninite.com. On the website, you will be able to choose from several free programs and then compile them into a single installer. Once you download the installer, you will have to run it and the installer will automatically install all the programs selected by you. However the only downside of Ninite is, the downloaded installer won’t contain all the programs, instead the installer will download those programs from the internet and install them. So if you intend to run the installer on a PC without an internet connection, the installer won’t be of any use to you. As for programs, Ninite offers you almost all of the major free programs available for various software categories such as web browser, messaging, media, Runtime, imaging, Documents, security, File sharing, developer tools, online storage, utilities, compression. 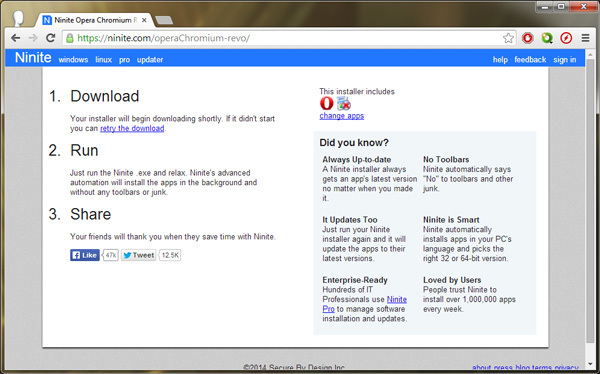 The instructions below will show you how you can create an installer using Ninite.com. Step 2: Select all the programs that you want to add in the custom installer. Step 3: Click on the Get installer button to download the custom installer. Once the installer is downloaded, run it on any PC and it will automatically install all the programs for you.